All of these styles are machine made paper carrier bags, printed externally to any design. Except for the J-Fixed carrier bags, they are produced with cut tops and a choice of fitted handles (brown or white twisted paper or paper tape). Sizes are limited to the factory machine settings, but usually a near match can be found. 1. Standard SOS Paper carrier bags, are manufactured with two main styles of handle, either a twisted paper cord or a paper tape handle. For general retail purposes these are glued internally with a paper patch to secure the handle. Material: White or brown paper, ribbed textures available. Sizes: Subject to nearest machine settings. Lead times subject to location of manufacture (4 to 7 weeks). These times are from approval of order AND artwork. 2. 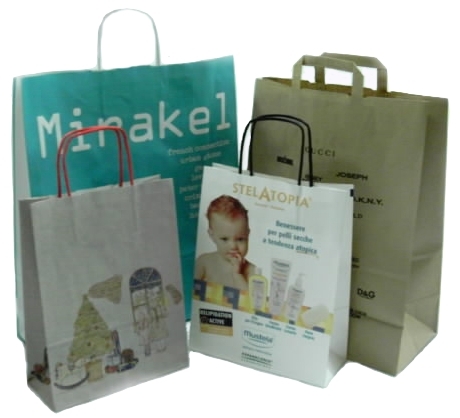 For food grade paper bags, the handles are manufactured from paper tape and glued externally to the bag. This style of bag can be produced without the handle if required. Produced from white or brown paper, these can be printed up to full colour. Material: White or brown kraft paper. Printing: 1 colour up to 4 colours, colours are better printed onto white paper. 3. As we would rather be environmentally conscious, and have a range of enviro bag options, there is the choice to have these carrier bags produced from a recycled paper. These are usually limited to brown kraft paper carrier bags with folded internal paper tape handles. Flexographic printing allows up to 4 colour of print on this style. Alternative paper source can be used if required, such as paper from sustainable forests. 4. We can also supply a J-Fixed handle for this style of carrier bag. This style of carrier bag has a turnover top, folding over a tape handle using a cut out J shape which conceals the paper patch attaching the handle to the bag. These can be printed up to full colour and optionally have a lamination of glossy varnish. Beckdale arrange the production of many styles of sos paper carrier bags. Our in house sales staff are happy to help managers purchase designer sos paper carrier bags. For choose by material or different styles of , contact our team via your preferred method.